Oh wow, it is nearly Christmas. I’ve been sitting on sketches to post for ages, but I’ve been busy. No, lazy. I’ve had a headache. My desk is messy. I’ve been Christmas shopping. Ah well so, here is one to get on with, and I’ll post the other more exciting sketches later. 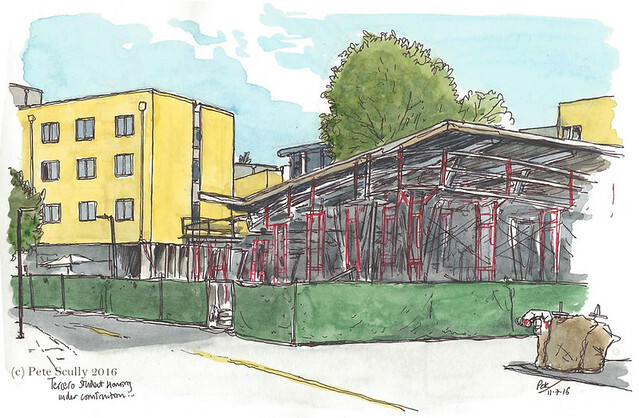 This is an in-construction sketch of the dorms at Tercero, UC Davis, the latest part of campus to be built. This area has changed so much since I first came here. This sketch was done over a month ago, so it probably looks a bit more done by now. That is not a reindeer in the corner of the sketch by the way. Hey have you seen Rogue One? Good isn’t it!